For those who haven’t had the pleasure, Bill Johnson is the senior pastor at Bethel church in Redding, California. It boasts a large congregation and no apparent gospel preaching (well, not that I’ve heard at any rate, and I have honestly listened to quite a few sermons, however I am here willing to be corrected). Bethel church manifests all of the usual the Toronto Blessing-style signs and wonders that accompany the New Apostolic Reformation crowd…angel feathers, glory clouds, and bizarre spiritual manifestations. It’s all there, nicely rounded off by a seemingly endless array of rather expensive kingdom building, prophetic or Jesus Culture ‘worship’ conferences (yes, you have to pay to attend a worship service. At my church they are free). It also has a world-famous a ‘Supernatural School of Ministry’ where you can sell up your earthly possessions and go and pay to learn to prophecy and hear God’s voice; receive prophetic dreams and visions of Jesus, heaven..you know, that kind of everyday stuff; heal people and raise people from the dead. No joke. With great zeal, many are flocking to get in on the ‘new thing’ God is doing. Sure, right now you might be saying, but Sherryn that all sounds great. What’s the problem…where do I sign up? Right? Well, after such such a stellar introduction, let me turn you over to Craig at the terrific Crosswise blog for a more scholarly and charitable assessment of some of Bill Johnson’s teachings. Stick it out to the end…it is worth it and is an excellent example how to biblically refute the multitude of problematic or outright false teachings flooding the church. This is something that all Christians would do well to get better at! Keep in mind folks, in a recent sermon Bill Johnson claimed that someone had been raised from the dead that week…like it was no big deal. Yet strangely he did not preach a gospel I recognised. It certainly made me wonder by whose power this ‘miracle’ was performed. This may help you understand just how charitable Craig is…and highlight perhaps, where I need some work! This teaching on the anointing corresponds with Johnson’s statements such as “He [Jesus] hadNO supernatural capabilities whatsoever!”20 and “Jesus had no ability to heal the sick. Hecouldn’t cast out devils, and He had no ability to raise the dead.”21 Given His total lack of inherent supernatural capabilities, this clearly indicates a temporally non-divine Jesus. This is usually referred to as the already but not yet. True believers have eternal securityalready, but we are not yet seated in the heavenlies. The last days have already begun at Jesus’ first coming, but the final consummation is not yet. This understanding that we have been in the last days since Christ’s earthly ministry is also known as inaugurated eschatology (sometimesrealized eschatology, but not in the absolute sense by some liberal theologians that there is no future eschatology), with the understanding that Jesus Christ’s Second Coming brings in the eschaton (end of all things). Note that this adequately answers the question posed in the above tweet: Johnson affirms Jesus’ full deity while on earth, but only in virtue of the assertion that “Jesus Christ is eternally God” (again, eternity never ceases). This is somewhat similar to the believer claiming to already have eternal life. In other words, in its context, Johnson is not necessarily affirmingtemporal divinity in the earthly Jesus in and of itself in the above tweet; but, in assertingeternal deity it can be comprehended as somewhat analogous to the believer’s dual status in Ephesians 2:6 and Colossians 3:1-3. Understood this way, Johnson’s tweet and the two quotations from the book referenced at the very beginning are adequately synthesized. Setting aside the fact that Johnson totally distorts the meaning of John 5:19 (“the Son of man can do nothing of Himself…”) by taking only a portion of this verse, wresting it from its proper context, we can understand this such that Jesus is an earthly non-divine man concurrent withan eternally divine Jesus. Some of the bolded portion will be discussed further below. Yet, the Facebook quote above from August 11, 2012 fits the basic thrust of Britton’s statement quite nicely – as exemplified by the title of this subsection as “A Man Living In Two Words”. Specifically, the Johnson statement “His limitations were in His humanity” [He was non-divine temporally on ‘this side of the veil’], “not His divinity” [He had full divinity in the eternal realm, on ‘the other side of the veil’] can align with Britton, especially when we add Johnson’s claims that Jesus is “eternally God” and “[b]ut He was also man”. To summarize this section: Keeping in mind Johnson’s teaching on the anointing, which indicates a temporally, earthly non-divine Jesus, who is only ‘linked’ to the divine via the anointing, we can systematize this doctrine with Johnson’s other statements that Jesus Christ is “eternally God” by understanding Jesus living in two different realms, the temporal and the eternal, simultaneously. That is, there is a temporally non-divine Jesus concurrent with an eternally divine Jesus. This is not unlike Manifest Sons of God teaching, and Johnson looks to be teaching a somewhat veiled MSoG at some times, while teaching it more explicitly at others. The first of these is not too dissimilar from the quotes in the very first part of this article; however, the “self imposed [sic] restriction” [should be “self-imposed”] part can be read such that Jesus had continually restricted Himself from utilizing the divine attributes He retained, throughout His earthly ministry. But, on the other hand, this can also be read that the Word’s limitation came just before the Incarnation in the form of a divestment, or partial divestment, of His divine attributes – or at least those divine attributes providing supernatural power – resulting in this “restriction”. In the second quote above, if we take the bolded section just as it is (and the quote in isolation from all other Johnson material), we could understand this to be stating that the Word retained all divine attributes when He became flesh, yet refrained from using His divine “privileges”, i.e., supernatural powers. But, on the other hand, this can be understood such that He was formerlyGod, that is, prior to becoming man, He was fully God; however, upon becoming a man He was no longer God having – to use one of the earlier quotes – “emptied Himself of divinity” when He entered the temporal realm. Alternatively, we can interpret this statement such that “He was fully God” means He was “eternally God” (fully God) concurrent with the time He was temporally non-divine “as a man”. 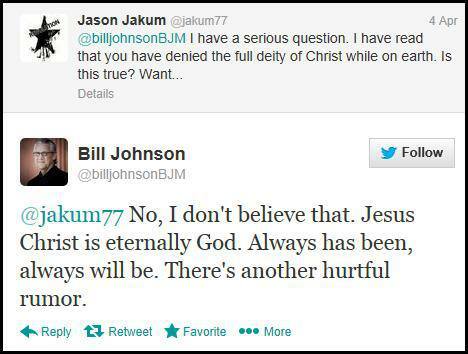 The latter understanding is congruent with our analysis of the rest of Bill Johnson’s statements. 15 Levi Dowling The Aquarian Gospel of Jesus the Christ: The Philosophic and Practical Basis of the Religion of the Aquarian Age of the World, © 1907 Eva S. Dowling and Leo W. Dowling, © 1935 and © 1964 Leo W. Dowling, (11thprinting, 1987), DeVorss, Marina del Rey, CA, p 6. Italics in original; bold added. 30 I’ve argued elsewhere that Bill Johnson is teaching that Jesus is really the Word of Faith (WoF) “rhema” word ‘made flesh’, aka the “present truth” word made flesh, in the following: <http://notunlikelee.wordpress.com/2013/02/24/open-challenge-to-fans-and-critics-of-bill-johnsonbethel-church/ >. This is also is consistent with the Gnostic/New Age doctrine of divine spark or divine seed within each person waiting to be awakened. 33 Alice A. Bailey The Externalisation of the Hierarchy, © 1957 Lucis, NY, 6th printing 1981, Fort Orange Press, Albany, NY, p 597. Emphasis added. Craig has a series of articles on this subject, as well as many other excellent ones.